All the languages spoken by the Finno-Ugric minorities in Europe are at least to some extent facing the risk of extinction. This is the finding of a three-and-a-half year European Union-sponsored project coordinated by Johannes Gutenberg University Mainz (JGU) and designed to study minority languages in Europe. The participating researchers looked at nine Finno-Ugric languages spoken in 12 linguistic communities in northern Europe, Russia, Slovenia, Austria, and Germany. The European Language Vitality Barometer (EuLaViBar), which was developed during the project, proved to be a suitable instrument for assessing the maintenance of the languages under investigation. It can also be used to determine the vitality of other languages as well. "We have taken a major step forward in language survival research," explained Anneli Sarhimaa, Professor of Northern European and Baltic Languages and Cultures at Mainz University. "Our project has shown that some of the minority languages we studied are under serious and acute threat of dying out. It also demonstrates that when the proper measures are taken, languages can be preserved and even revitalized." The EU has supplied EUR 2.7 million to fund the European Language Diversity for All (ELDIA) project since 2010. The future looks particularly bad for Kven, a Finnic language spoken in the Finnmark region of Norway. From the 16th century to the late 19th century, the ancestors of the Kven people migrated from the northern parts of Finland and Sweden to north Norway. For a long time, the Kvens were subjected to a strict policy of Norwegianization. It is surmised that some 10,000 to 60,000 ethnic Kvens still live in Norway although the number of active Kven speakers is estimated at a mere 1,500 to 2,500. Even though the language is currently being standardized, its use in the educational system, the media, and on an everyday basis is very limited. Kven scored lowest of all on the vitality barometer. Karelian in Finland and Meänkieli in Sweden are only marginally better off. The project report indicates that the lowest barometer scores registered were characteristic of the languages investigated in these three Nordic countries. On the basis of the report, it would seem that the generally very progressive attitudes of these countries when it comes to humanitarian matters, democracy, and human rights do not automatically also predispose them towards the adoption of an appropriate language policy for vulnerable linguistic communities and minorities. On a scale of zero to four, none of the twelve linguistic communities achieved a score notably better than three in any of the parameters examined; in some cases the result was even significantly lower. "All of the minority languages under investigation therefore urgently need support in one form or another," states the report. The project also looked at the current status of Estonian in Germany and of Hungarian in Austria and Slovenia. A total of 5,000 questionnaires were evaluated and almost 200 interviews were conducted. "The high participation rate in the survey shows how important this subject is to many minorities," emphasized Sarhimaa, coordinator of ELDIA. In the case of Meänkieli, for example, almost 60 percent of the questionnaires where completed and sent back. "The most important aspect, however, is that the barometer provides us with a tool that not only helps us identify the threats to a language but also the measures that should be implemented to save it." 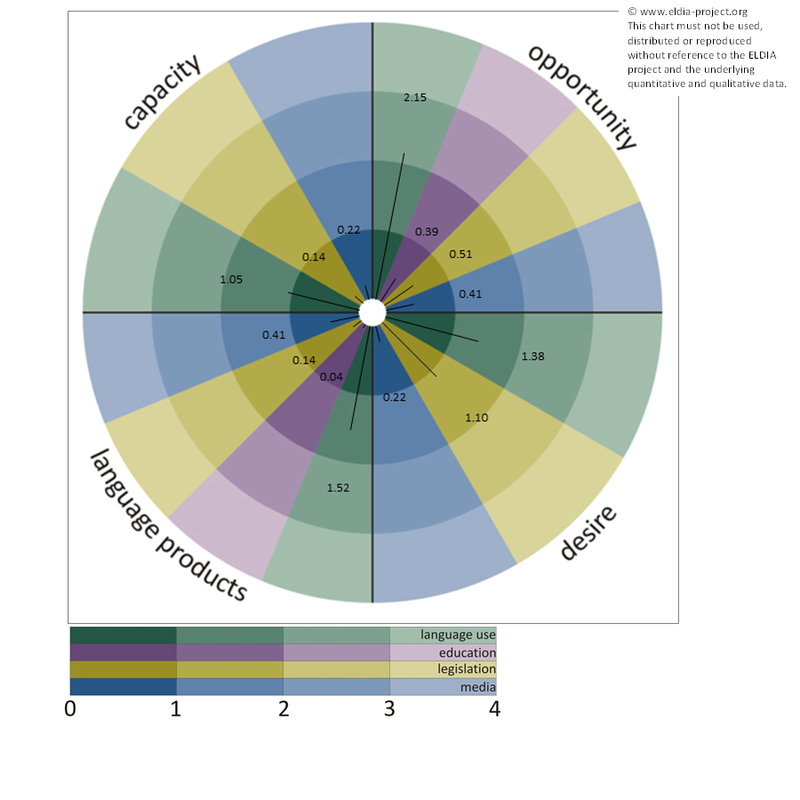 The European Language Vitality Barometer is the first device for measuring language maintenance which is based on empirical data. The same principal can be employed for all minority languages. Specialists in the fields of Applied Linguistics and Sociolinguistics, Law, Sociology, and Statistics from eight universities in six European countries participated in the project. The findings have been published in several scientific articles and other publications. 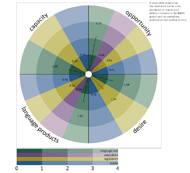 In fall 2013, the barometer will be made available in the form of a toolkit. Related theoretical and methodological developments will be discussed and evaluated in a book to be published in 2014. The vitality status of Karelian in Finland according to the EuLaViBar: The chart indicates that the status of the language here is very worrying. In terms of the main parameters "Capacity" and "Language Products", Karelian in Finland is critically endangered while in terms of "Opportunity" and "Desire" the language is seriously endangered.